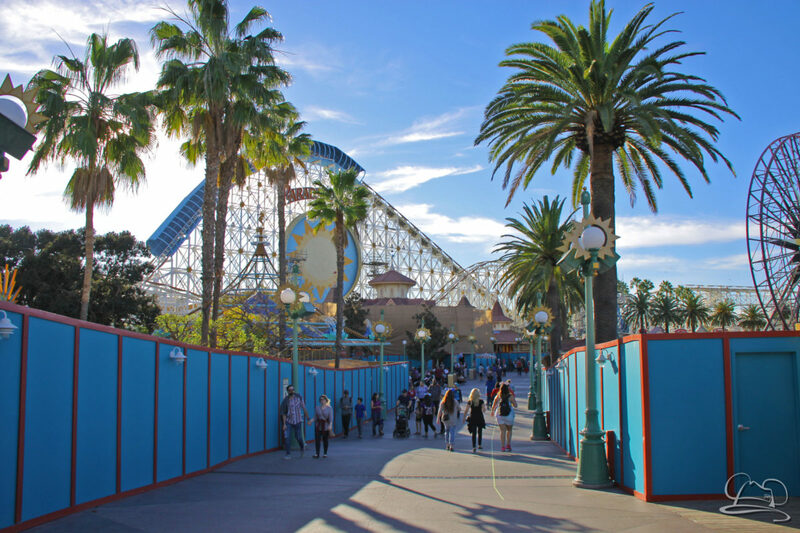 Wall where father showed son that The Incredibles are coming to Disney California Adventure. A child walks into Disney California Adventure with his family. He is excited to see Mickey and Minnie on Buena Vista Street. As they move further back into the park he gets more excited as he sees that the world of Cars has come alive and he can meet Mater in Cars Land. After a quick cruise through Ornament Valley on Radiator Springs Racers the family heads to go on Midway Mania. Clearly, it becomes evident that things are changing. The walls surround them and they wonder if there really is something at the end of this path. Finally, they discover there IS a queue and an attraction and the family has a great time on Midway Mania. After a brief restroom stop, the family sits down next to a wall around what was once the queue for California Screamin. The father looks up and sees concept art for what will be The Incredicoaster. More of his friends, the Incredibles, will be coming to Disney California Adventure and he can’t wait! 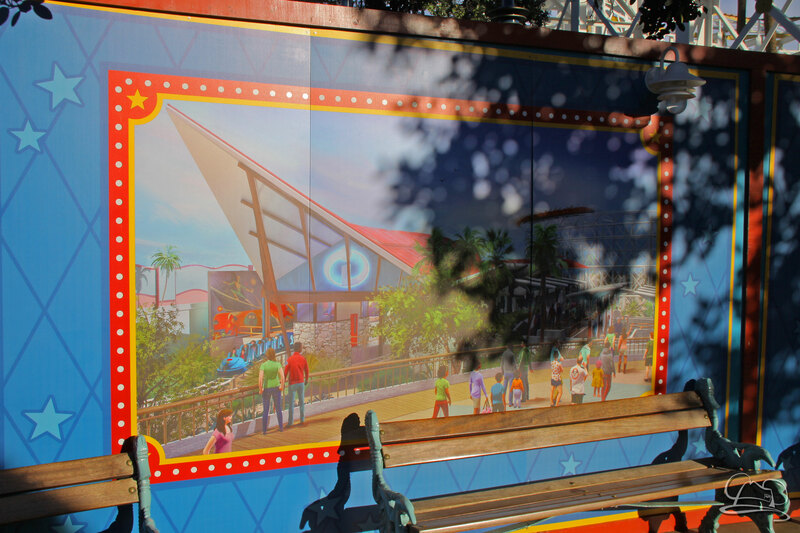 While the setup for this story is completely fictional, yesterday while at Disney California Adventure I did observe a father show his son the concept art for The Incredicoaster on one of the walls surrounding the former California Screamin. The boy was ecstatic to learn that there would soon be an attraction based on what was clearly some of his favorite characters. In that moment, a light went off in my head as I enjoyed watching some Disney magic happen because of a wall. There are very few successful things in life that haven’t changed. Walt Disney famously said, “Disneyland will never be completed. It will continue to grow as long as there is imagination left in the world.” With imagination comes new ideas. With new ideas come new opportunities. If those opportunities are acted open, things will change. Without imagination, change, or growth, things stay stagnant and eventually die off. The Disney Parks are always walking a fine line between a nostalgic love of what has come before and the innovative excitement of what could be! Walt Disney was always about new ideas and pursuing new dreams. There was always a looking forward to what’s next and what could be done better from what had already been done. Thankfully, The Walt Disney Company has continued to follow this example. As Disney continues to innovate and imagine, things continue to change. Some of these innovations mean a new queue for a flying elephant. Others lead to the re-theming of areas. Others have changed an unmemorable bountiful farm into a land that transports guests into the world of Pixar’s Cars. In the not too distant future guests will be able to go to what was once basically a farm and instead go to the planet Batuu and have some out of this world experiences. In the nearer future, a little boy will be able to race like Dash and experience that feeling one gets when one of their favorite movies comes to life. The only way any of this can happen though is by putting up those walls of change. They surround the work as Disney does its magic to make the Disney experience even more magical for those visiting the Disney Parks and Resorts. While walls might not initially seem that magical, they are the necessary curtain that hides the reveal. 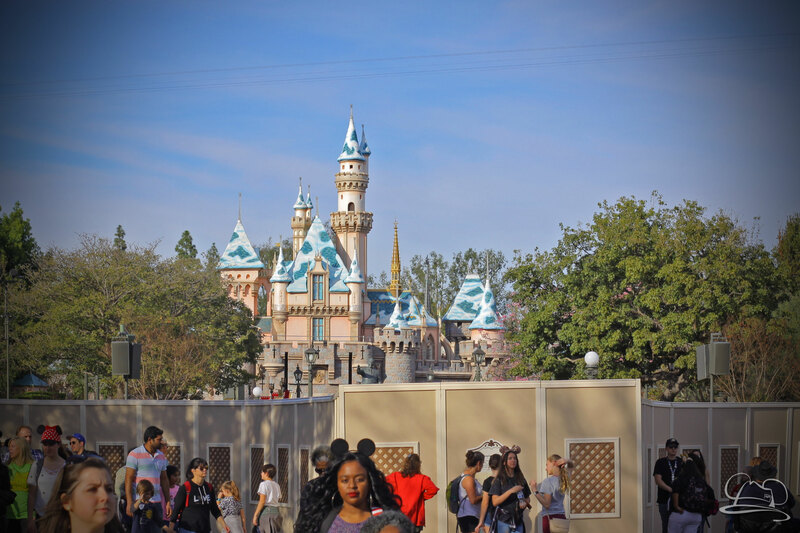 In the past I’ve viewed the walls of change at Disneyland as a necessary irritant. However, after seeing the magic that can come from these walls for a little boy at the Disneyland Resort, I have had my opinion changed. The walls lead to something wonderful and that is definitely something to be excited about!